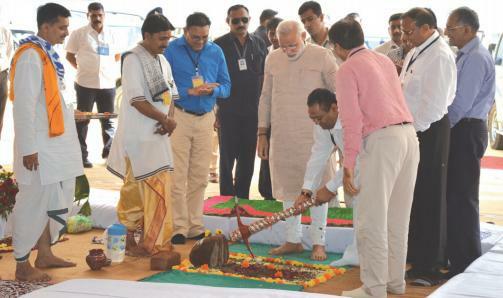 Gujarat Chief Minister Shri Narendra Modi today afternoon performed ground breaking of proposed Patidar community hospital in Katargam area of Surat. Addressing a gathering on this occasion, Shri Modi said that a movement to connect the people of this nation will be kicked off on Sardar Patel birth anniversary on 31st of October this year. Shri Modi proposed Surat city to give him 1,000 volunteers for a month-long iron collection drive for proposed statue of unity. Shri Govindbhai Dholakia, Trustee Mathurbhai Savani, Laljibhai Patel, Tulsibhai Goti, Savjibhai Dholakia and other donors welcomed the Chief Minister. Shri Vasantbhai Lakhani – main donor who has donated Rs. 52 crore, and Shri Lavji Badshah another donor who has donated Rs. 11 crore for the hospital project were honored by Chief Minister. The proposed ‘Kiran’ hospital will be constructed at a cost of Rs. 500 crore. It will be possibly the biggest hospital of its kind. Rs. 300 crore fund has been collected already. A 13-storeyed hospital will have helipad on the top. It will also have its own air ambulance. The hospital will also have a health insurance scheme.Rs. 1723 premium will avail treatment worth Rs. 1 lakh for husband, wife and two children. The idea of hospital project was muted by Kiran export’s Vallabhbhai Lakhani. The hospital therefore has been named as ‘Kiran’ hospital. The hospital will be run by Samasta Patidar Trust. The project site is located on Vastadevdi road in Katargam. Proposed hospital will serve people belonging to all communities. Surat Municipal Corporation(SMC)has allotted land for proposed 8 lakh sq ft hospital.